Starting stack per player is 15k. 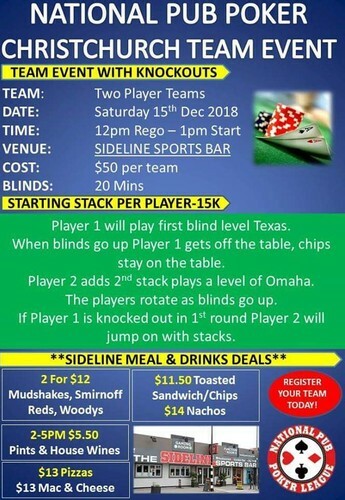 Player 1 will pay first blind level Texas, when blinds go up player 1 gets off the table, chips stay on the table. Player 2 adds 2nd stack plays a level of Omaha. The players rotate as blind goes up. If player 1 is knocked out in 1st round player 2 will jump on with stacks. There will be awesome meal and drink specials that will earn you more chips! Rego 12pm, kicks off 1pm.